I have been working with Justin Harris for almost a year now, and having him to keep me on track this offseason has a been huge. 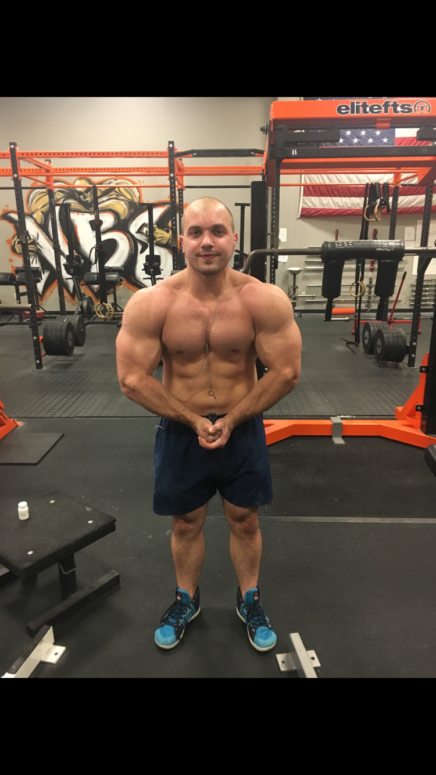 When we started I was 198lbs and now I am 20lbs heavier, and I’m the leanest I have ever been at this weight and easily eating the most food I ever had in my life. I have a small appetite, so pushing the calories high has been a challenge for me. 2 weeks ago, on a check in, he brought down the calories, and this is what my new diet looks like now. It’s nice to be eating less food. *Note: I don’t only eat meat and rice and peanut butter. This was just for an example. Low carb days – 1x a week on my non-training day. Medium carb days – 3x a week on smaller muscle groups like arms, shoulders, or any “pump” day I may do. High carb days – 3x a week on Chest, back, and leg day. I am also doing 3 sessions of steady state cardio a week, 20 minutes per session, post workout.